Last month, it was all I could do to scrape up a few photos for my Bloom Day post. This month, I had the opposite problem: how to select a limited amount of images from a superabundance of lovely flowers and foliage. I think I’ve whittled the list down to a manageable amount, so without further rambling, here are some highlights of August color here in southeastern Pennsylvania. Within the last week, the supposed ‘Violetta’ artichoke (Cynara scolymus) that I started from seed back in February finally came into flower. 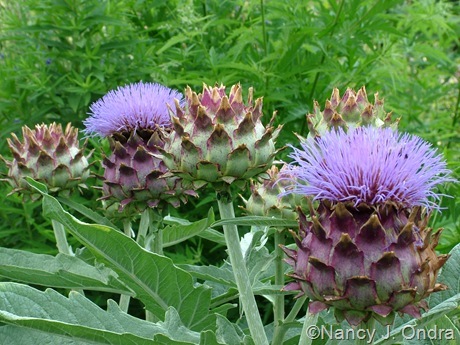 Looks a lot more like cardoon (Cynara cardunculus) to me. 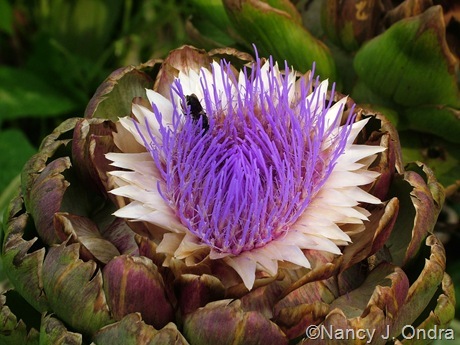 Below is a true artichoke flower, from this date last year. 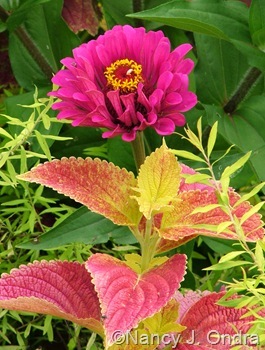 Either way, I think the blooms are pretty cool. 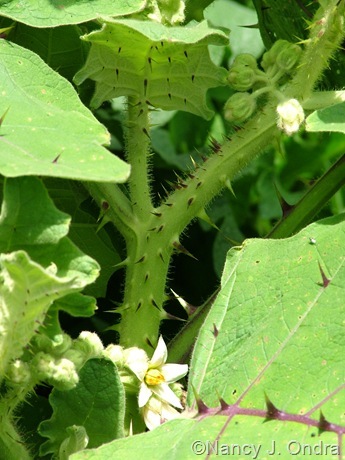 The bees think so too; there are usually a few of them crawling on the flowers at any point during the day. 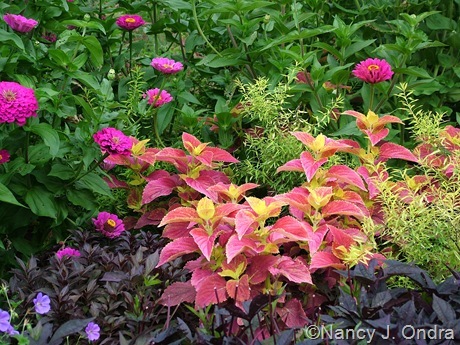 The combination below is even more of an extravaganza for bees, and birds and butterflies as well: bloodflower (Asclepias curassavica) in front; the foliage of ‘Golden Delicious’ pineapple sage (Salvia elegans) and the flowers of ‘Raspberry Wine’ bee balm (Monarda) in the middle; and ‘Velvet Queen’ sunflower (Helianthus annuus) in the back. 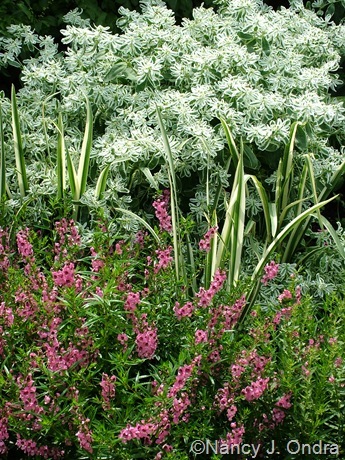 Below, a pretty pink-and-white pairing of annual snow-on-the-mountain (Euphorbia marginata), variegated Japanese iris (Iris ensata ‘Variegata’), and ‘Angelmist Deep Pink’ angelonia. 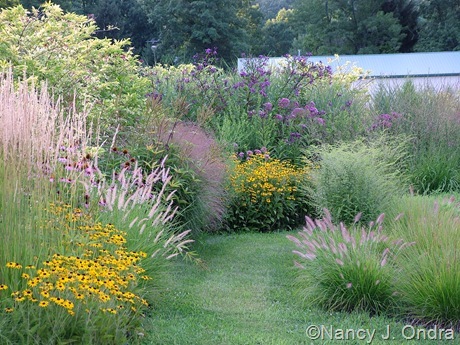 Elsewhere, a somewhat similar color combo from a seedling phlox, pony tail grass (Stipa tenuissima), and a snow-on-the-mountain that seeded in from the bed across the path. 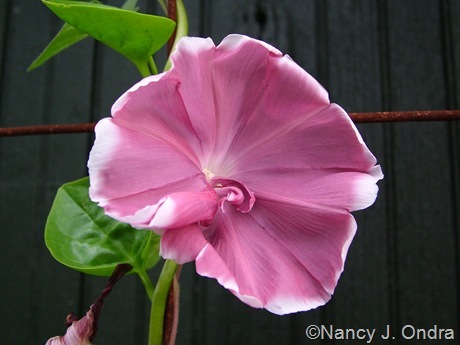 And yet another pink-and-white combo, in just one plant: ‘Chocolate’ morning glory (Ipomoea nil) with the foliage of malabar spinach (Basella alba). Ok, enough pink. So, how about blue and white instead? 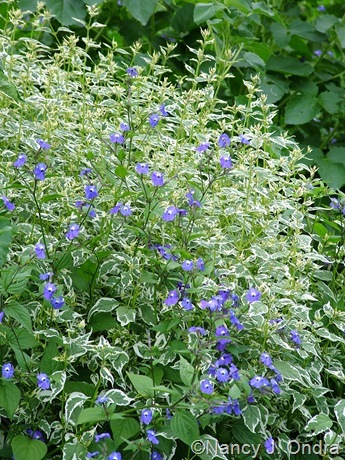 Here’s the cute annual Browallia americana weaving through the variegated leaves of ‘Snow Fairy’ caryopteris (Caryopteris divaricata). 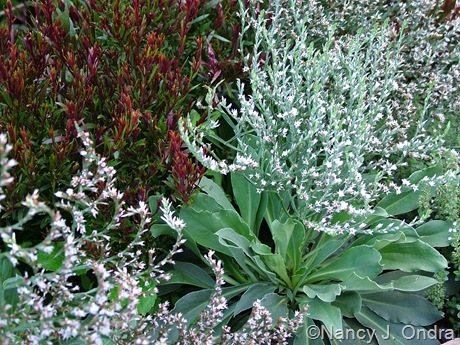 For something a little more intense, here’s a pairing of two experiments for me this year: white German statice (known as Goniolimon tataricum, Limonium dumosum, and several other names) with the reddish summer foliage of ‘Passionate Pink’ gaura. I’m not sure I really like that combination, but it’s kind of interesting, in a something-different way. 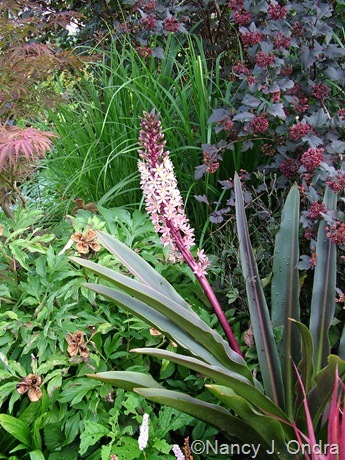 …and ‘Oakhurst’ pineapple lily (Eucomis comosa) with the seedpods and green leaves of Paeonia mollis, the bright green foliage of Calamagrostis brachytricha, and the dark leaves and seed capsules of Diabolo ninebark (Physocarpus opulifolius ‘Monlo’). 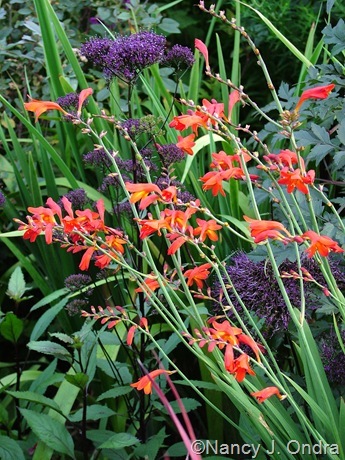 Right next to this grouping is a zippier pairing of bright red ‘Emberglow’ crocosmia and deep purple ‘Lake Louise’ throatwort (Trachelium caeruleum). 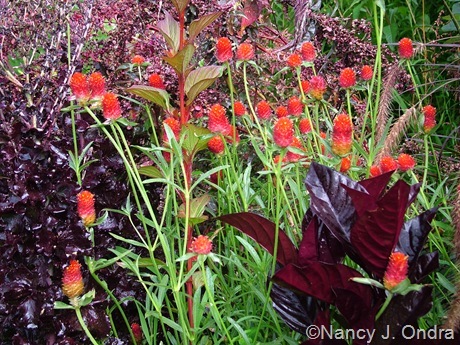 Across the path, another lively combo of annuals and tender perennials: ‘Strawberry Fields’ globe amaranth (Gomphrena) with Pseuderanthemum atropurpureum ‘Rubrum’ and ‘Merlot’ lettuce. 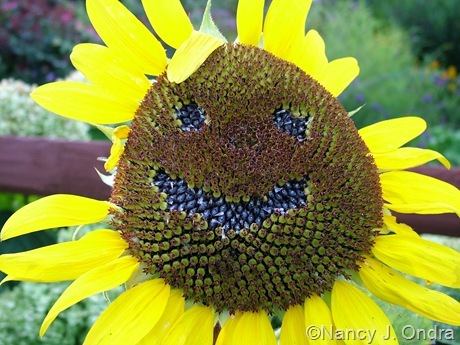 Nothing says summer like coneflowers. 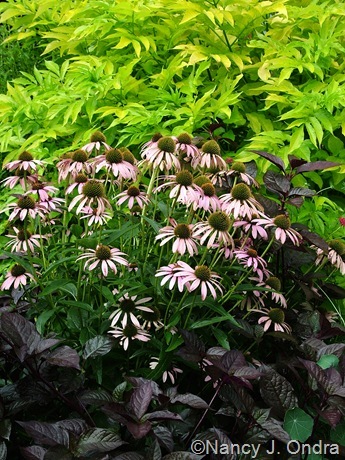 Below is a self-sown purple coneflower (Echinacea purpurea) in between ‘Purple Knight’ alternanthera and golden elderberry (Sambucus nigra ‘Aurea’). 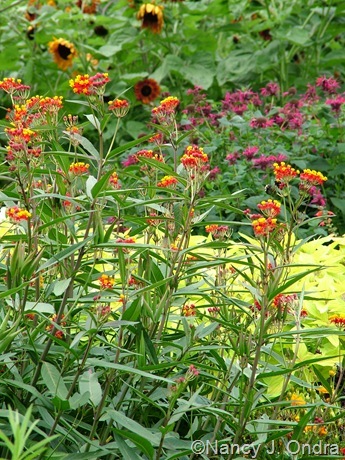 Below, a wider garden shot of orange coneflowers (Rudbeckia fulgida var. 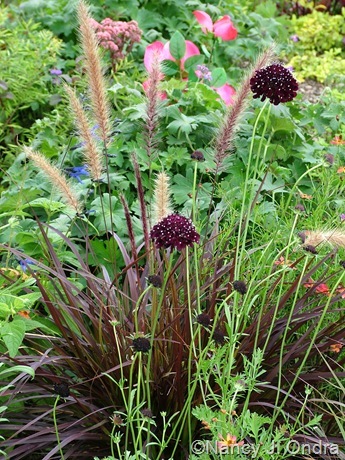 fulgida), purple ironweed (Vernonia), and pink Joe-Pye weed (Eupatoriadelphus) adding contrast of color and form to a variety of glorious grasses, including ‘Karl Foerster’ feather reed grass (Calamagrostis x acutiflora), ‘Karley Rose’ fountain grass (Pennisetum orientale), ‘Rotstrahlbusch’ switch grass (Panicum virgatum), and ‘Cassian’ fountain grass (Pennisetum alopecuroides). 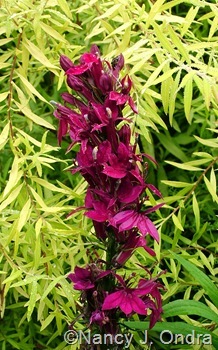 Above, ‘Flevo Party’ gladiolus; below, ‘Fan Burgundy’ lobelia with Mellow Yellow spirea (Spiraea thunbergii ‘Ogon’). 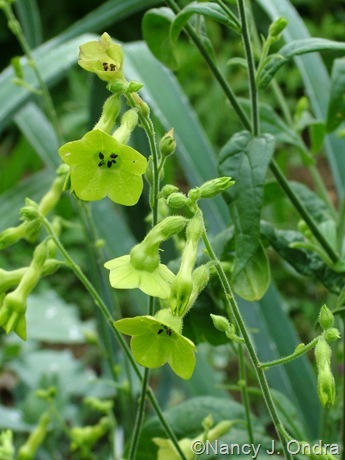 Above, ‘Limelight’ four-o’clock (Mirabilis jalapa); below, ‘Ondra’s Green Mix’ flowering tobacco (Nicotiana). 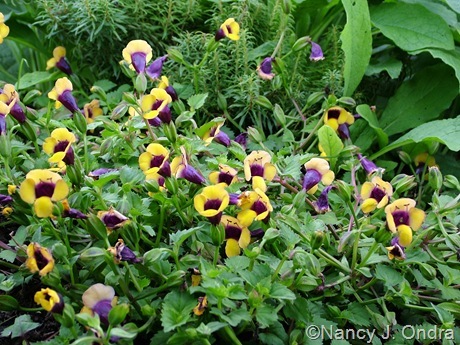 Above, bed-of-nails or naranjillo (Solanum quitoense); below, ‘Golden Moon’ wishbone flower (Torenia). 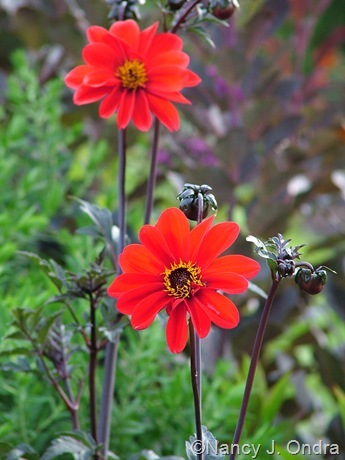 For more Bloom Day delights from all over the world, be sure to visit the main Bloom Day post at May Dreams Gardens. 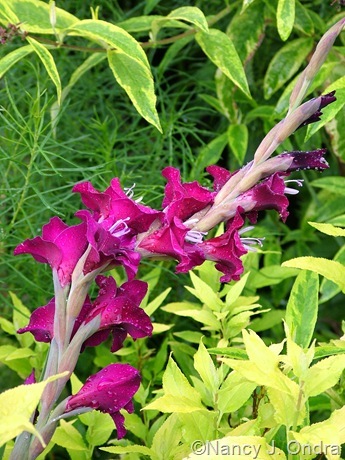 Your gardens are so awesome! 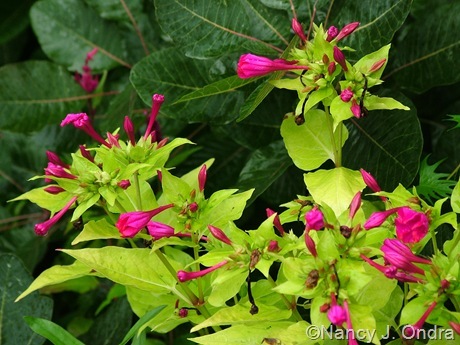 I’ve never seen such a bunch of uncommon plants in one garden. You really delight in the unusual don’t you? 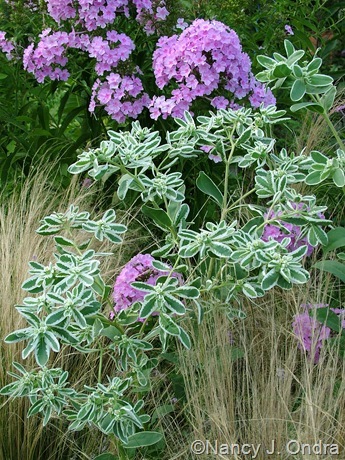 I do enjoy trying new things, though I’m now also putting thought into using more common plants in interesting combinations. I’m glad you enjoyed this old post; it was one of my favorites.